Deon Cole's Black Box is an American comedy television series that premiered on June 10, 2013, on TBS. The series features Deon Cole (stand-up comic and comedy writer) as he provides his commentary on videos found via the internet and television. 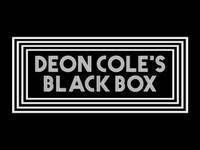 On October 25, 2013, Deon Cole announced via Twitter that Black Box would not be returning to TBS. This webpage uses material from the Wikipedia article "Deon_Cole%27s_Black_Box" and is licensed under the GNU Free Documentation License. Reality TV World is not responsible for any errors or omissions the Wikipedia article may contain.